Turok essentially took a year off in 1999, only appearing in the multi-player focused Turok: Rage Wars, and in its stead rose two new potential franchises for Acclaim that they acquired after their purchase of Valiant comics: The first up was Shadow Man, a game I’ll take about in a few months, in September of 1999 followed by Armorines: Project S.W.A.R.M in the month of November. 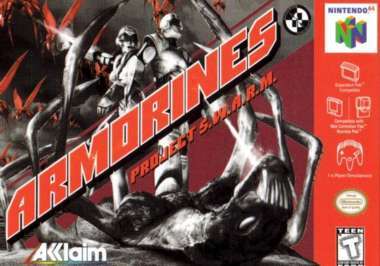 Of the three properties that they mined from their acquisition of Valiant, Armorines was the only game that didn’t receive a second chapter even though it boiled down to a Starship Troopers knock-off that played like Turok 2: Seeds of Evil only replacing dinosaur monsters with space alien bugs, a premise that sounds not that bad on paper. Armorines arrived at a time in my life when my Nintendo glasses were starting to crack as I looked towards games on Sony’s PSOne and Sega’s then new Dreamcast, so it was a title I missed out on sixteen years ago. In playing it now for this year-long feature for the first time, it appears I wasn’t really missing that much as Armorines: Project S.W.A.R.M doesn’t came close to even the original Turok: Dinosaur Hunter in terms of enjoyment and has easily become an early candidate for a potential “Acclaim games to be skipped” feature. Like the Turok series, Armorines is pretty anemic when it comes to story: You play as one of two characters, a male or female, who are part of an elite unit of armored space marines (Armorines, get it?! ), who are fighting to save humanity against a species of hostile alien bugs. As I stated above, the property I’m assuming was chosen for video game adaptation from Acclaim’s catalogue to capitalize on the Starship Troopers film that came one year before it, which is pretty clever when you think about it: Why pay for a license to make a game when you own something that is the exact same thing? I will admit, Danny Trejo is much more intimidating than Colonel Campbell. Unfortunately the basic premise is where the two properties part ways as Armorines is a game with little to no personality. Despite coming a year after Turok 2, Armorines has little in the way of presentation: no cut-scenes, no recorded voice, you’re just given a brief introduction to your mission from a guy who looks like Danny Trejo speaking to you through Metal Gear Solid’s codec and you’re sent on your merry way. At the start of the game you’re given the choice of being a male or female character, which I’ll admit is nice, but there’s not that much of a difference between the two other than they carry different weapons from one another, so don’t expect anything like Turok 3’s minimal replay incentive here; either you want to play with a machine gun or a shot-gun, that’s what you get here. Put a gun to my head and I couldn’t tell you either character’s name and I couldn’t be bothered to look them up because it’s really not that important. While Armorine’s story won’t entise you to play, the controls will as this is a straight up Turok 2 clone: you move with the C-Buttons, aim without the option of being able to switch from inverted on the control stick with every other function being exactly the same. Whereas Turok 2 prided itself on fidelity over performance, Armorines is the exact opposite. The game does support a resolution upgrade for those with the expansion pack and when you can actually see the game (a LOT more on that later…), things don’t like quite as sharp as the Turok sequel, but your character moves much faster which I prefer any day of the week. The only thing that isn’t quite up to speed is the weapon selection, which isn’t that big a deal as you’ll only ever need your starting weapon most of the time. Turok’s big selling point and a reason why people still talk about it today is its over the top weapons, and this is an area in which this title is severely lacking. Whether you play as the male or female character you’re starting weapon has unlimited ammunition that only has to be quickly reloaded after the ammo clip depletes. You do get extra weapons like a grenade launcher, a rocket launcher, a chemical gun and a noise maker that will attract bugs so you can clear them out, but I never really had to switch weapons unless I needed to do so as part of an objective like blowing up bug holes. You switch weapons by holding “A” and hitting the control stick and hitting the control stick in a direction, but there’s no weapon wheel like in Turok 2 to tell you what you’re selecting, so getting to what you need when being swarmed (no pun intended) by enemies is never ideal. While a rocket launcher or something with more destructive power may possibly be more ideal in hairier situations, it will never serve the most useful function of your regular gun, and that’s as a light source. Armorines is a very dark game, and I don’t mean tonally, I mean as in “I can’t see where I’m going” and it makes this game insanely frustrating. In indoor levels and for a majority of the games middle section you’ll fumble around areas not being able to see in front of you, shooting of clip after clip of your gun just to catch a glimpse of a door to shoot or a hole to crawl into in order to progress. You do get IR googles that help with the problem, but not in the way you want them to the most. 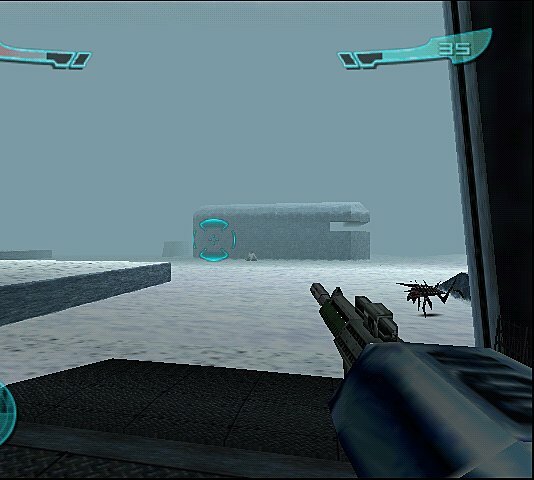 When you throw on your goggles, activated by hitting left on the directional pad, you can see enemies clearly but things just get darker to the point where you can run into a pit fall or a lave trap that would have been clearly visible with your goggles up, so you have to decide what you want more: to see enemies or traps? For me, it’s the latter of the two because Armorines has a really awful checkpoint system. Don’t let this opening stage fool you, the game is rarely this coherent. This game takes a page from Rare’s Goldeneye 007 or Perfect dark where each level you enter has several conditions that must be met in order for you to truly finish it. The levels can be really long sometimes and it gets tiring spending so much time trying to finish a level only to have to do it again or get really far and die with the same result. Making matters worse is that the objectives sometimes are unclear and you’re not really sure what you have to do to meet them. For example, in one level you have to destroy bug spawning points, but you’re never shown what those are. Logically you blow up one that has bugs endlessly spawning from it and then think that these are what you have to destroy, that is, until you run into empty holes that are the exact same thing with no bugs coming from them at all. It’s things like this that make this game such a chore to play, and it makes you long for the extra try system in Turok’s 1 and 2, or the retry system that they went with in Turok 3 a year later. Then there’s the matter of the enemies which aren’t as fun to fight as those in Turok. 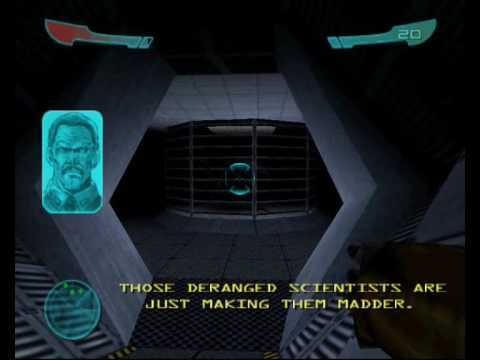 Even in the original Turok enemies would react when shot in different areas, often hilariously, and that was greatly expanded upon in the sequel which had some pretty fantastic AI. Armorine’s alien bugs would have perhaps been an interesting enemy if in a swarm of thousands, but the most you’ll ever shoot on-screen at once is maybe four or five. The enemies do get larger, shoot projectiles and take more bullets to put down, but you never quite fear them as like you do the larger enemies in Turok, especially when they really only over charge at you with little to no regard for their safety. With the power of Acclaim’s impressive Turok 2 engine, the idea of a Starship Troopers-esque FPS doesn’t sound like a bad idea, but Armorines was maybe too ambitious for the hardware it found itself on. The controls are solid, which is to be expected as they’re the same as the Turok series, but everything else from the weapons, level design and enemies failed to come together in a way that’s even remotely fun. There’s a lot of great first-person shooters on the N64; Armorines unfortunately isn’t one of them.